Fionna and Marshall Lee was to the party when they have been attacked by hundreds of monsters. Do you want to help them to kill the enemy? Collect gems to unlock upgrades on the shop. Try to kill all the monsters. How long can you survive in this endless battle? Good luck! Many people love the animated television series Adventure Time and its main heroes Finn, Jake and Fionna They.is live in the "Land of Ooo." This is a country full of surreal characters and talking animals, where magic and high technology combine to create strange new objects or people engage in adventures. In this action game, developed by Cartoon Network, you can join Fiona and Marshall Lee in their adventures. They were going to the feast of Lumpy Space Prince when they were attacked by a pack of evil monsters! Looks like it's time to fight and move! Jump from enemy to enemy to cut his army! Stay sharp with four different swords with gives you powerful attacks. Are you ready to take this challenge? 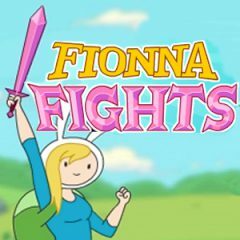 Begin the battle with Fionna and kill all monsters!